I've been in a super cake mood lately. Pretty much eating gourmet cupcakes every other day of the week. Needless to say, I am addicted to good cake. I think cake is pretty subjective, some people like dense, some people like lighter fluffier cake. While I'm not too picky on the texture as long as the texture matches what the cake was intended to taste like. I like my cupcake lighter and super moist, but when it comes to bundt cake, I like it dense and creamy. 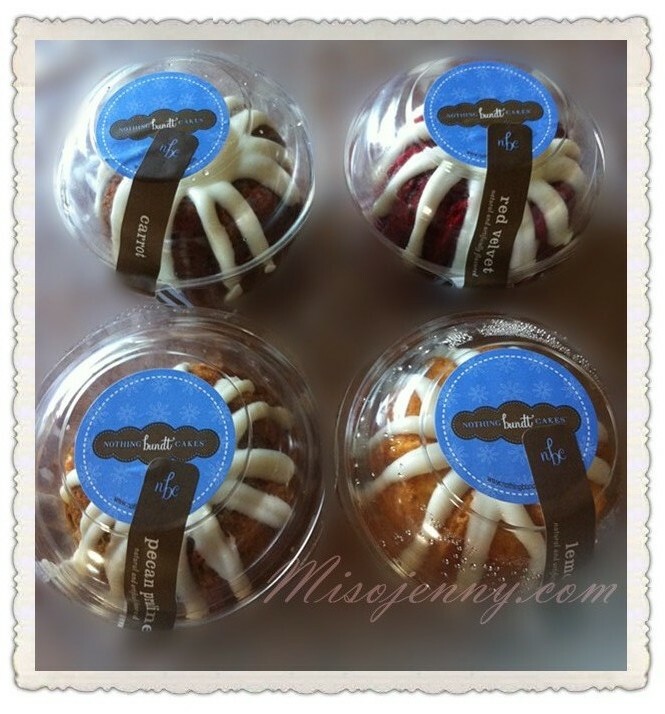 Bundt cakes are really just a normal cake baked in a "bundt pan", which just means that it is in a ring shape with decorative ridges. So pretty much a cake with a hole in the middle. This little place in Sunnyvale is quite the gem. Customers can order over 40 different designs of cake and over 10 flavors. Cakes also comes in assorted sizes. 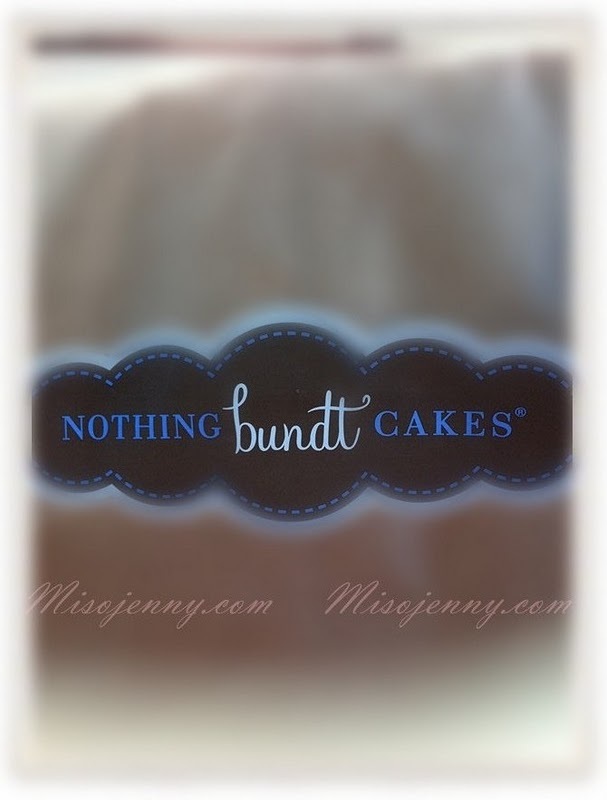 I got 4 flavors "bundtlets" (for more information about sizing please click here) Decor was very happy and cheery. Presentation of the bundt cakes is adorable and ideal for parties, meetings or personal gifts. The cakes are dense and flavorful. I won't go into depth on every flavor, but I will talk a little bit about the red velvet cake. 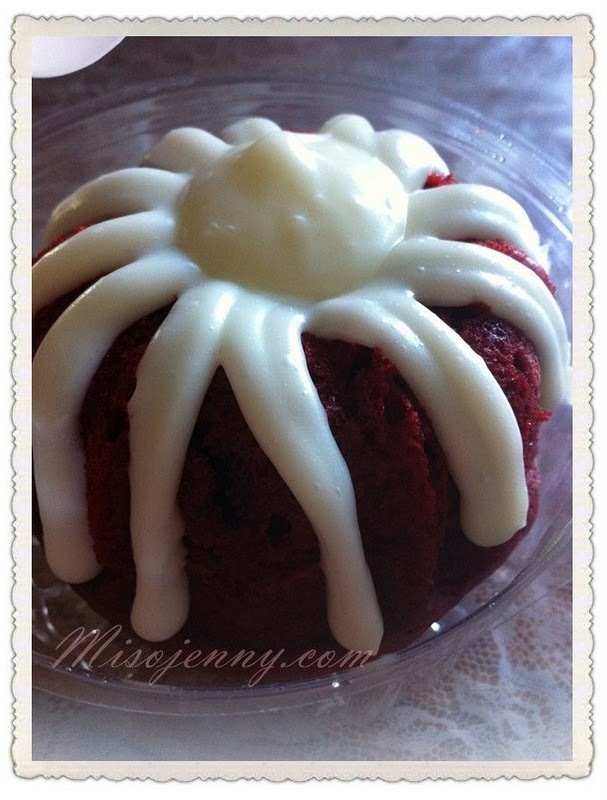 The red velvet cake from Nothing Bundt Cakes is decent, but it really isn't THE best red velvet I've tasted. I think it comes down to a matter of preference, because this particular cake comes with chocolate chips inside. The addition of texture of the chocolate is nice and it gives it another layer of flavor, but to me red velvet cake should be smooth, decadent, and without interruption. I almost felt like the chocolate chip took away from that indulging experience. Nonetheless, the cakes are exceptional in texture and moisture. The cream cheese frosting has a thicker consistency which holds the same of the frosting and gives the frosting a glistening surface. Cakes are a bit sweet for my taste but perfect with a cup of coffee. I would end my day with this guilty pleasure any day. Thank you so much for being with me today. Don't forget to follow me on yelp and eat your way to happiness with me! Click here to find me on Yelp!